I’d seen Hollywood Undead on Scuzz a few weeks ago and they were intriguing. It was weird, because they sounded a bit like a nu-metal band (albeit 10 years too late), but with a heavier hip-hop influence. Nevertheless, I was looking forward to stuff they might be doing, and if they’d be touring the UK any time soon. As it happened, they were supporting The Blackout, which I was due to shoot anyway. A short review of their performance is just below the picture. 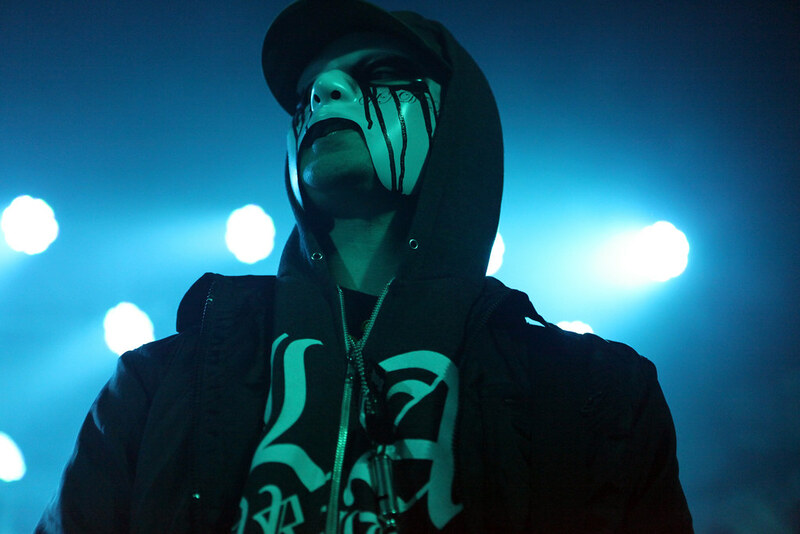 Hollywood Undead carry themselves as a bit of an underground, menacing act. Their faceless appearance, covered by masks and bandanas is intimidating, and for a band from Los Angeles, comparative to the thugs tearing the city apart in the riots of 1992. Still, their brand of hip-hop infused metal is popular with the young crowd, who are sold on their visual identity. The band open with ‘Undead’, which modestly is a song about themselves and how amazing they are, pointing out they have tattoos, drink-drive Cadillacs with brass knuckles in the back and will “rock the whole place.” The set appears to be getting more and more immature as time progresses. 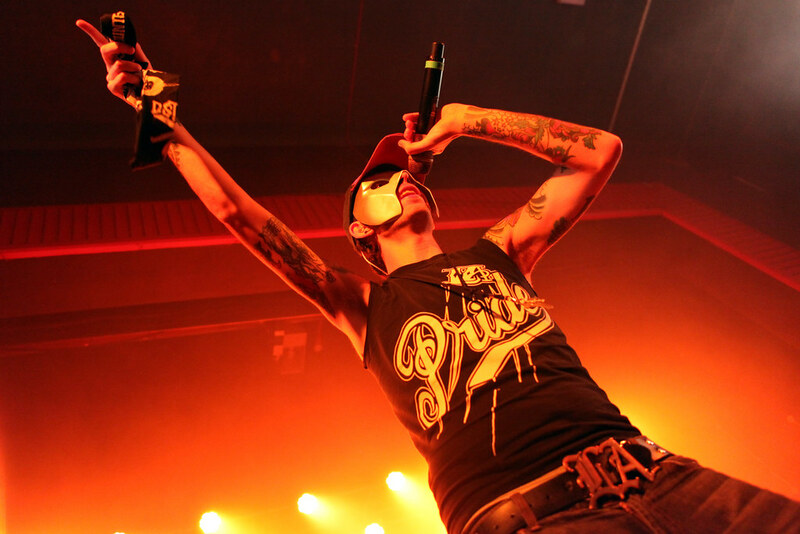 That’s not to say Hollywood Undead’s music isn’t infectious. Disregarding the actual lyrics, the deliberately aggressive tone and beats are reflected in the mosh, with a full circle pit opening and a steady stream of crowd surfers heading over the barrier. How could the crowd not react to a act made up of parts named Charlie Scene, Johnny 3 Tears, J-Dog, Da Kurlzz, Deuce and Funny Man? But astonishingly, after only a couple of songs, five of the six members remove their masks, destroying any air of mystery they had managed to acquire. It seems the masks are simply for effect, and aren’t part of the ethos of the act. Other bands have managed to pull off hiding their identity; Mushroomhead, Mudvayne, and GWAR to name a few, but none as famous as Slipknot or Kiss. In this respect however, the difference between Hollywood Undead and Slipknot is that the latter managed to keep the masks for a decade before removing them. Not two songs. 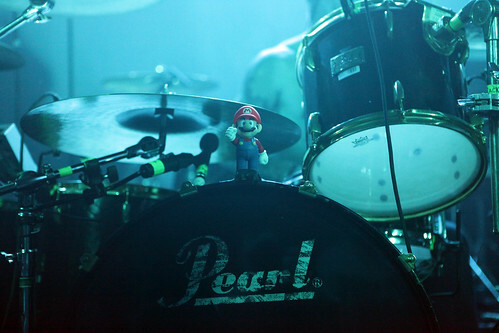 There’s no doubt about it though, Hollywood Undead entertain, and are set to be around for a bit. There are no other bands on the scene like them, and this could well signal a new era of collaborative metal and hip-hop. Nu-metal has returned, only this time, it’s heavier.